Become a PRINCE2 Practitioner in only five days! Find out what makes up the PRINCE2 methodology, and how to apply it to your projects, in a classroom environment where you can learn from both the trainer and each other. ILX Group’s accredited PRINCE2 Foundation & Practitioner classroom course contains all the training and materials you need to attain both the Foundation & Practitioner qualifications in just five days. 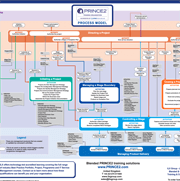 The PRINCE2 Foundation introduces you to the PRINCE2 method, whilst the Practitioner teaches you to apply and tailor PRINCE2 to the running and managing of a project. This course conforms to the 2017 syllabus. There is mandatory online pre-course work that must be undertaken prior to attending this course. It is expected that it will take approximately six to eight hours to complete. You will be sent full instructions with a link to the online pre course within 48 hours of your confirmed booking. In addition, whilst attending your course there will also be some examination preparation evening work. How do i access my pre-course?